In this PhD research, the major environmental challenges of our time, such as climate change, sustainable energy transition and scarcity of resources, are approached from a spatial, landscape-architectural perspective. The goal is to accelerate the transition to liveable, low carbon cities. The focus of the research is at the local scale and attempts to turn challenges into opportunities for a better quality of life and living environment. Since 1857, when Frederick Law Olmsted combined the construction of two large drinking water reservoirs for the city of New York with the design of a beautiful park, these types of assignments are part of a landscape architect's job. At that time, the issue was to solve the problem of drinking water while now we are concerned about solving the combination of very diverse and different flows. This renders the assignment more complex but certainly no less landscape architectonic. As part of this research, many functions, flows, areas and actors in the urban landscape system of Rotterdam have been studied. This research focuses on the development, design and testing of new approaches to strengthen existing urban qualities and to tackle problems in such a way that positive effects for other functions (synergies) arise at the same time in order to improve the quality of life in cities. Energy transition: exchange of residual flows of heat in order to achieve a more sustainable energy supply. Urban agriculture and nutrients: urban waste flows of phosphorus and urban agriculture as related to liveability. All these themes could also be investigated per sector and that is often what is done, however this research looks at their inter-connectedness and the possibility to promote synergies. For this, it is important to know what kind of synergies can be achieved and for whom. As a result, planning for synergies in a structured way is possible. Landscape architectural, urban ecological and governance theories are used to extract building blocks and to set up a so-called Synergetic Urban Landscape Planning (SULP) approach. This is an integrated approach that allows us to explore, imagine and plan synergies so as to accelerate the transition to a liveable, low carbon city. During the research process, SULP has continuously been reinforced by incorporating the results of the separate studies on water, climate, energy, urban agriculture and nutrients. 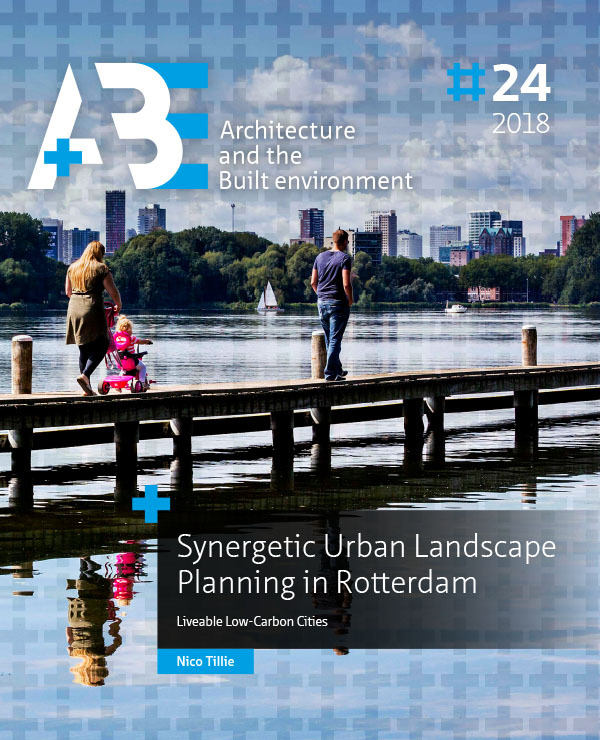 Synergetic urban landscape planning forms the bridge between CO2 and livability goals on the one hand, and principles for sustainable urban development on the other. This research and this approach were fed with, and strengthened by, the results of separate studies on water, climate, energy, urban agriculture and nutrients. To test this approach, SULP building blocks were used in the inner city of Rotterdam. Possible densification and greening strategies were built together with stakeholders. This has resulted in a plan for the various components such as water and energy, which greatly improved multiple liveability aspects of the inner city and reduced CO2 emissions per capita. These results were also used to further develop the SULP approach such as the development of the ‘Smart City Planner’, based on the principles and indicators of sustainable cities, an assessment tool linked to Geographical Information Systems (GIS). This tool can be used to assess the sustainability performance of neighbourhoods as well as to plan for synergies. This research contributes to sustainable urban development and emphasizes the role of landscape architecture in this regard as it provides synergies within urban metabolism (flows in the city). It also leads to closer cooperation with other disciplines. New approaches have been developed through SULP some of which have already been successfully applied, for example, the ‘Rotterdam Energy Approach and Planning’ (REAP) as well as the ‘Smart City Planner’. Approaches that accelerate the transition to a liveable, low carbon city!